Form, function, and Mexican Wrestling. Each Luchador Botte Opener is a mini-wrestler applying a famous lock hold to an opponent--in this case a beer bottle.ÊMeasures approximately 2-3/4 by 6-inch. Made of stainless steel and ABS with a rubberized coating. 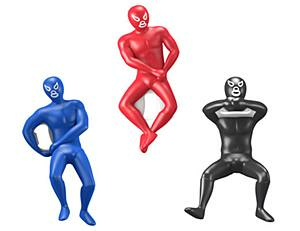 The Luchador Bottle Openers were designed by Andres Lhima as part of the Mexico Design Challenge "Desarrollando Talento Mexicano" (Developing Mexican Talent). A program organized by Kikkerland, in collaboration with Ariel Rojo, Gava Design and the UNAM (Universidad Nacional Autonoma de Mexico). Price is per luchador. Styles subject to availability.